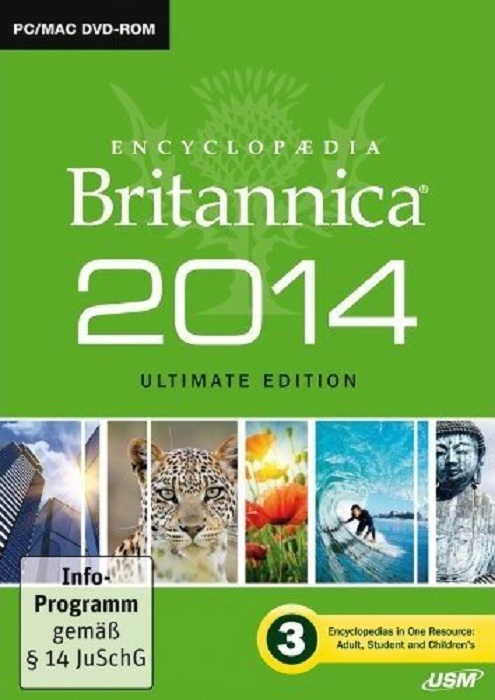 Encyclopaedia Britannica Ultimate 2014 Win/MacOSX ISO-TEL | Free eBooks Download - EBOOKEE! Posted on 2014-02-07, by bruce990. The Encyclopaedia Britannica 2014 Ultimate DVD offers you more than ever, including extensive new and revised articles to put you at the forefront of recent advances so you can spend less time searching and more time learning. Written by 4,300 expert contributors the Encyclopaedia Britannica 2014 Ultimate DVD is an invaluable resource for all the family, and as itâ€™s from Britannica you know it is information you can trust! For 2014 our three-age specific, easy to use learning areas have all been updated with a wealth of new information. Advanced-level content for secondary school, university students and adults. A vast array of detailed articles written by notable experts. Contains both short and book-length articles on a huge range of subjects. Intermediate-level content for students aged 10-14. Provides interactive study guides, exercises, activities and useful tips to encourage confident learning and accurate research. Introductory-level content for young pupils aged 6-10. Shorter articles with fun and easy learning tools for primary school children. Helps to build confidence and improves skills learned at school. Mac Â® OS 10.45x and 10.6.x. No comments for "Encyclopaedia Britannica Ultimate 2014 Win/MacOSX ISO-TEL".